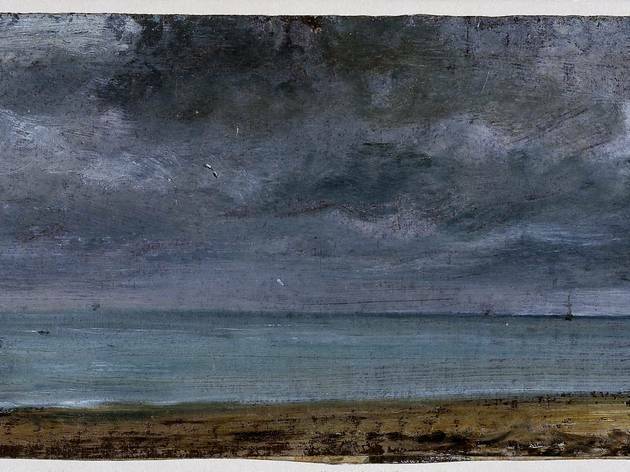 'Branch Hill Pond, Hampstead', c.1821-22, John Constable. &copy; Victoria and Albert Museum, London. 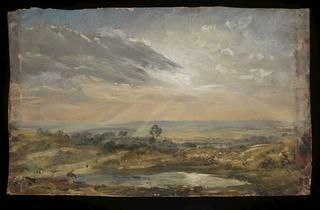 'Reverse Branch Hill Pond, Hampstead', c.1821-22, John Constable. &copy; Victoria and Albert Museum, London. 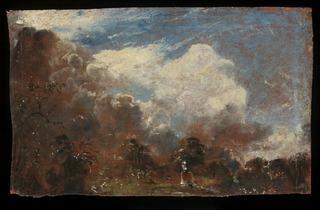 'Full-scale study for Hay Wain', c.1821, John Constable. &copy; Victoria and Albert Museum, London. There is a kind of decompression chamber at the start of this show. 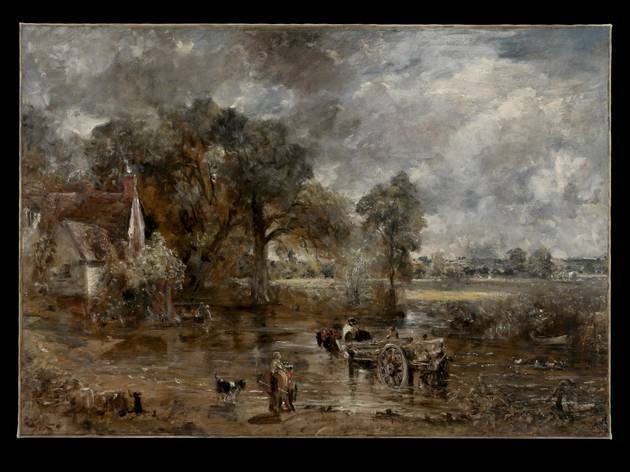 You stand before a screen that fills the wall while real-life scenes made famous by John Constable’s paintings – including Willy Lott’s Suffolk cottage from ‘The Hay Wain’ – gently roll by, apparently unchanged since he painted them a couple of centuries ago. It’ll soothe your soul, which could be a problem if you’ve come to see a radically reinterpreted Constable rather than the comfy heritage industry Constable we think we know. Don’t reach for the Werther’s Originals yet, though. 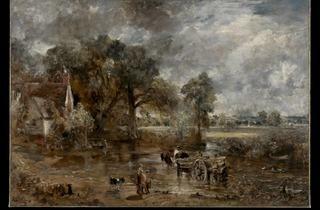 For, while ‘Constable: The Making of the Master’ hardly unearths a biopic-friendly eccentric of JMW Turner proportions (think Hugh Bonneville in a Boxing Day special rather than Tim Spall in ‘Mr Turner’) it accentuates Constable’s endless focus and tireless study to such a degree that he winds up seeming more radiantly strange than all those mills and streams suggest. 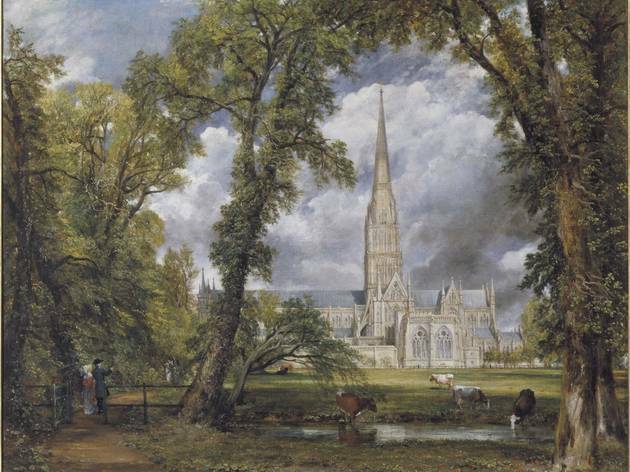 The show delivers a dual message: that Constable revived landscape painting in nineteenth-century England by combining his love of fields and meadows with an equal passion for the art of the past. 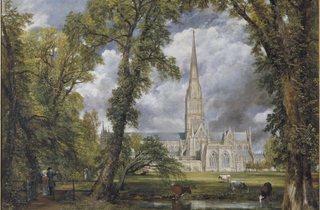 It’s especially great at showing you how Constable learned from paintings and prints by Old Masters which, as a wealthy and well-connected man, he was able to borrow or buy. 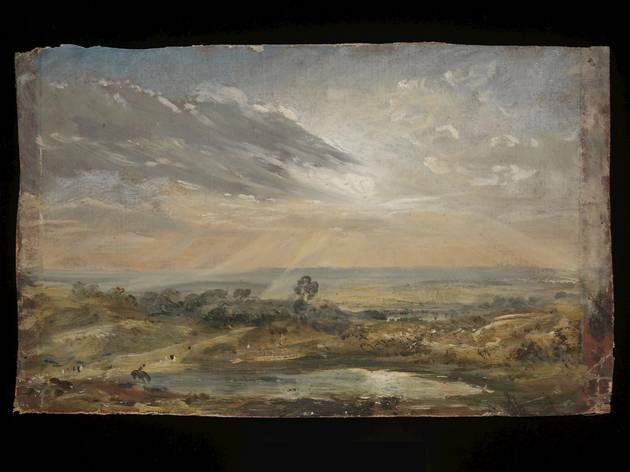 You’ll spend quite a while shifting from one foot to the other as you play spot the difference between paintings by Claude Lorrain and Jacob van Ruisdael and Constable’s versions. 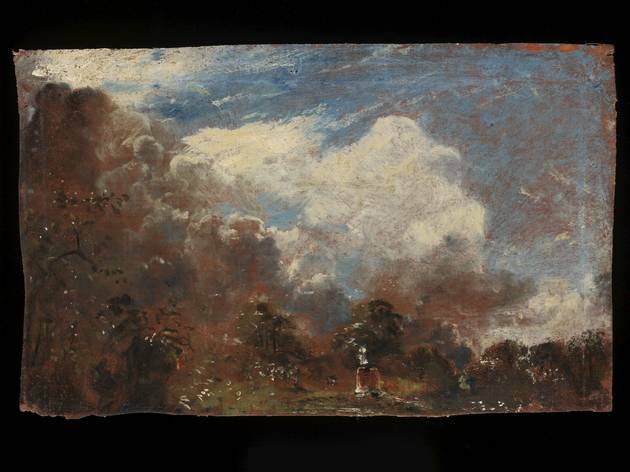 Sir Robert Peel gave up his Ruisdael ‘Winter Scene’ (1660s) for a while so that Constable could copy it; at Peel’s request Constable added a dog to distinguish it from the original. 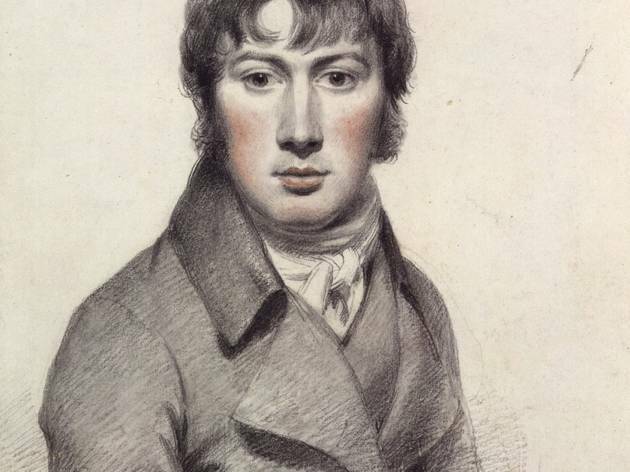 You’ll play the same game as you trace the development of Constable’s own works, going from his exquisite notebook drawings (of which too few are on show) to studies made in the open air, to full-size studio oil sketches in which worked out compositions, to the polished academy paintings that wowed them in Paris. There’s a sense of diminishing returns as life seemingly ebbs from images like ‘The Leaping Horse’ (1824-’25) as they get refined and finessed. But such fastidiousness is, in the end, part of the fascinating psychology of a man who imitated works by Ruisdael and Claude Lorrain in obsessive detail to see how exactly how they were put together. 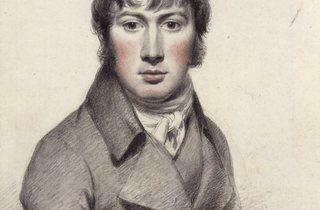 With ‘Late Turner’ currently at Tate Britain, comparisons between the two great painters are inevitable. 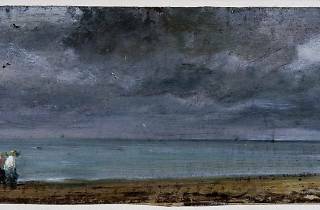 This revelatory exhibition shows that, while perhaps we project too much on to Turner’s suggestive mists, we read too little into Constable’s dogged pursuit of the real. "There’s a sense of diminishing returns as life seemingly ebbs from images like ‘The Leaping Horse’ (1824-’25) as they get refined and finessed." I'm not sure this is fair or true. Yes, it is fascinating to see the six foot studies alongside the finished pieces; but that the final paintings are less alive than the rough studies, is a peculiar observation, and entirely subjective.